Glacial archaeology - Site Jimdo de archaeologyglaciers! Collection of mule bones from the Theodul glacier, Zermatt, Switzerland. Photo by Sophie Providoli. The accelerated melting of glaciers in the Alps is freeing up many archaeological relics which have demonstrated the use of high altitude passes since prehistoric times. There is an urgency to collect and conserve these archaeological findings as most objects consist of perishable material and, once exposed to the environment, rapidly degrade and decompose. Sponsored by the Swiss National Science Foundation, the Canton of Valais and the University of Fribourg, the goal of this 4 years project (2011-2014) was to locate areas with the highest potential for discovering archaeological items at high altitude passes (3’000 to 3’500 m asl) in the Pennine Alps. The disappearance of this prehistoric and/or historic material is an inestimable loss which would impede the understanding of how people have used these glaciated high altitude passages throughout history. This mountain range, located between the Canton of Valais in Switzerland and Italy, is one of the most glaciated territories of the whole alpine arc. The methods used in this research project included a historical archival text analysis, geospatial modelling and archaeological prospection in the field. Archaeologists conducted several surveys on 13 different sites. They collected over 100 pieces of wood either on the glaciers' surface or along their margins. The C14 dating results showed that these glaciated passages were used in Early Middle Ages, the Roman period and even during Prehistoric times, more than 2000 years ago. 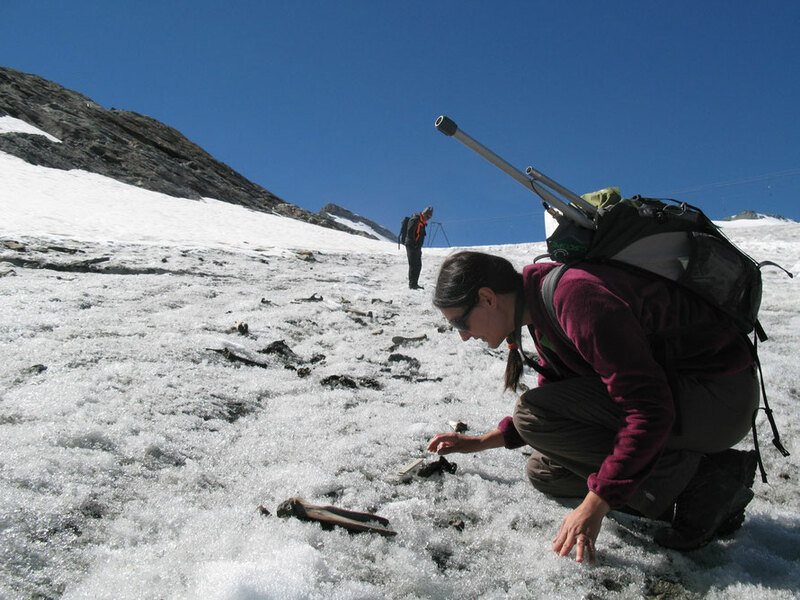 INTERVIEW, SUMMER 2017, Glacial archaeology in the Valais, Switzerland, ca 20 minutes (in French). FIELDWORK, SUMMER 2016: a short reportage (in French) of 1 minute 30. If you find an artefact, don't pick it up!